Go gorilla trekking to Virunga national park in the eastern province of Democratic Republic of Congo with Gorilla Trek Africa Limited. A Congo gorilla safari is a remarkable Africa adventure experience that leave lasting impressions.Despite the less visits, Congo is an exceptional travel destination sheltering a quarter of the world’s mountain gorillas in Virunga national park covering Congo’s share of the Virunga Conservation area.Besides mountain gorillas,Dr Congo is home to the Eastern lowland gorillas in Kahuzi Biega national park in Bukavu. At Gorilla Trek Africa, we arrange Congo gorilla tours from Kigali crossing over to Congo. Gorilla encounters in Congo are complemented by Nyiragongo volcano climbing which together makes a complete Congo safari package. Gorilla tours to Congo are done through Kigali were travelers fly to Kigali international airport and cross over to Congo through Rubavu/Goma border in North Kivu province and Cyangugu south of Lake Kivu. 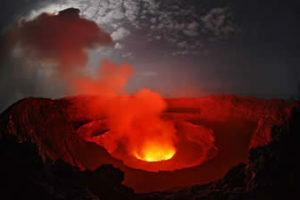 Besides gorilla trekking, Congo offers you the most exceptional hiking tours to the top of the active Nyiragongo Volcano whose summit shelters the world’s largest lava lake. At present, mountain gorilla tours to Virunga national park are closed due to insecurity issues related to kidnap and killing of park rangers last year. However, the park is expected resume next year.